I am so excited that it’s Kid’s Clothes Week time again! I’ve got a pile of things to finish for Oliver and am hoping to get them all done this week. 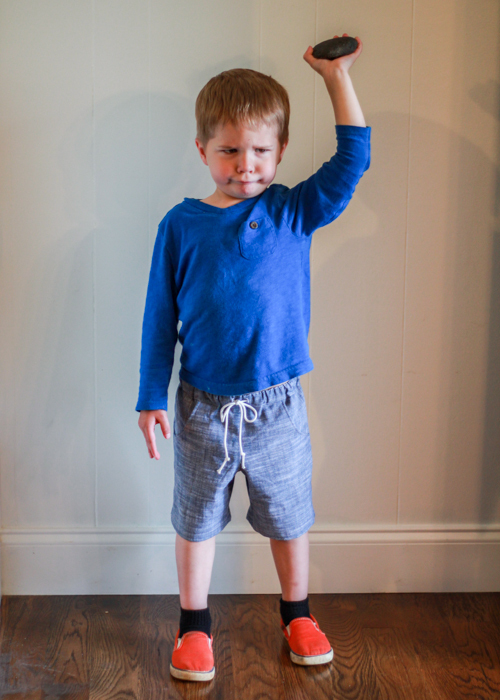 Mostly basics- the kid only has one pair of summer pjs! But since I know how easy it is to make pjs, I just can’t bring myself to buy him any. I let him pick out some fabric for new ones and plan to get them whipped up over the next few days. First off, some new shorts! I have yet to have much success with getting Oliver to wear shorts this spring. 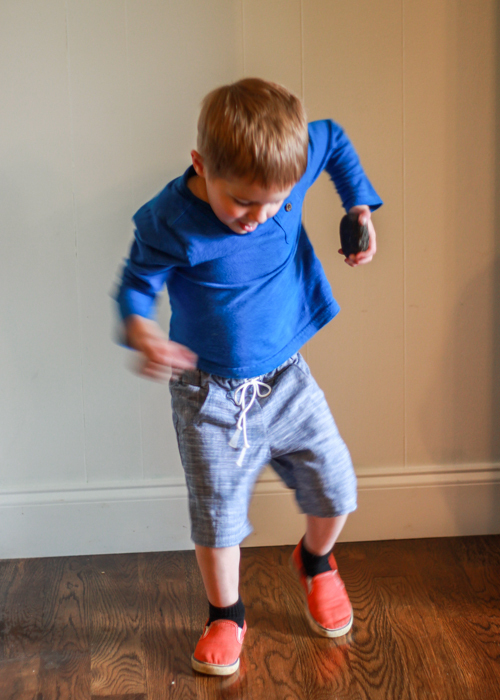 He loves to wear his jeans every day- so I’m introducing him to the “jean” (aka chambray) shorts. Chambray used is the Kaufman Union Stretch Shirting– bought from Fabric.com a while back. This is a super lightweight chambray so it’s perfect for summer shorts. The pattern is the free Oliver+S Sunny Day Shorts. 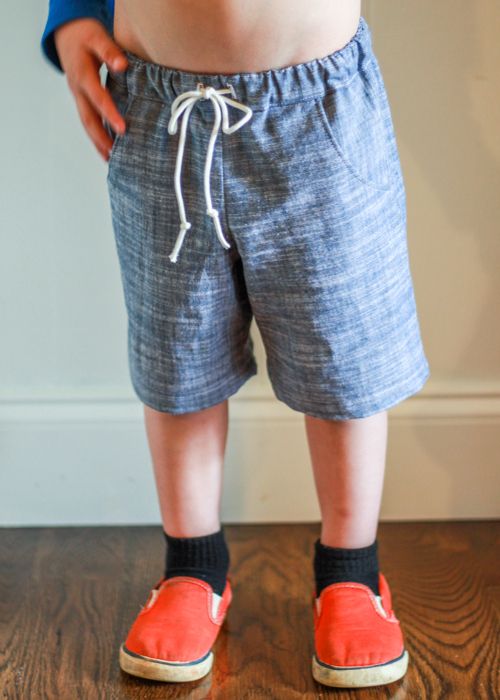 I used Kristin’s tutorial to add pockets and a drawstring waistband to the shorts. If these look familiar, I made almost the same exact pair for him last year. 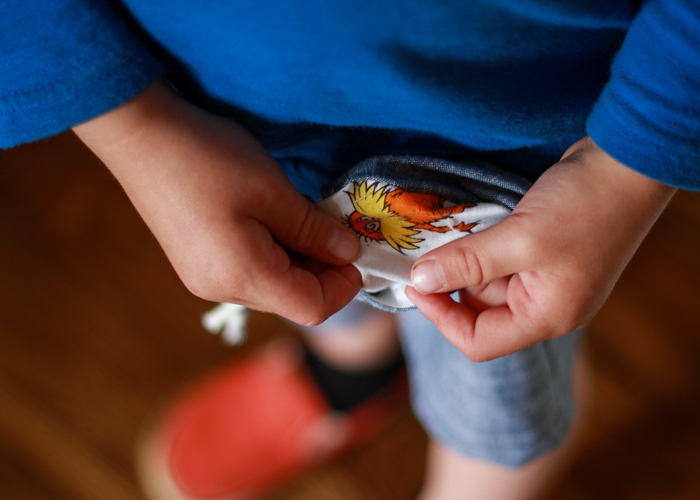 (blogged here) That pair is too short for him now so he needed another pair. I made the 4T but added 1.5″ to the length because I think they run a bit on the short side. These are now a bit long but at the rate he’s growing, I’d like to give him a little length so hopefully they will fit all summer! 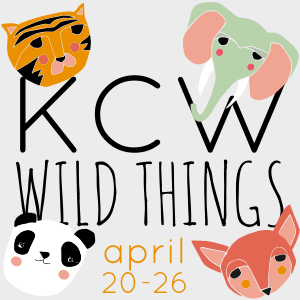 So theme for Spring 2015 KCW is Wild Things…You may think that this has nothing to do with wild animals. Think again. 🙂 I let Oliver pick out the lining fabric (my new trick for getting him to wear his handmades) and he picked out this Dr. Seuss menagerie print- from the Celebrate Seuss line- it has a mix of all the animals and creatures from a bunch of his books. Definitely fits the wild things label! And a happy dance for new shorts! Here’s hoping for a productive KCW! What about you?What’s on your sewing list this week? Can’t wait to peruse the site’s community pool and see all the fun outfits pop up! 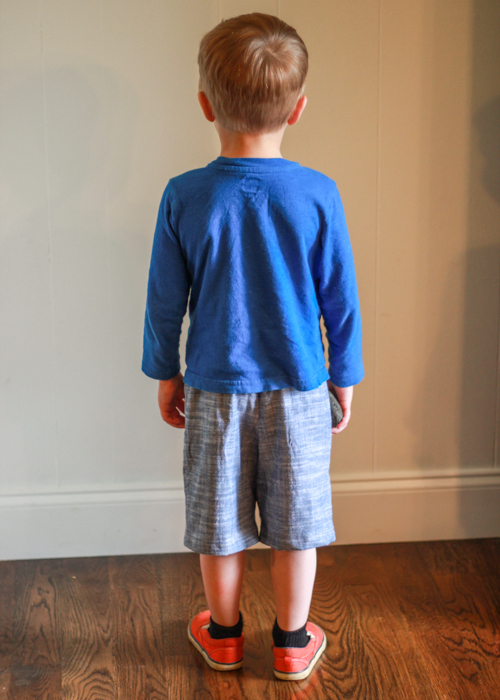 This entry was posted in Kid sewing and tagged kids clothes week, oliver + s patterns by oliver's fancy. Bookmark the permalink. What fun shorts! The fun lining is genius! Thanks for sharing the link to the pattern. I will have to check it out. Thanks. Fun lining is always feels like a secret little happy element to a garment. No one else can see it but you know it’s there!